I have argued with myself and better argued with which way to go with the tank and have decided to stick with the freshwater idea. I have missed having a tropical set up and can always change my mind down the line but once its up and running I dont think it will change for a while. Thats the utility area sorted, the new flooring and kitchen being decorated starts monday then its onto the livingroom and the fishtanks, I can't wait now. My bad lmao. I should not be allowed out the door. Well plans have all changed yet again. We went to pick up some dead rock to start it seeding for the 5ft tank, while there we were looking at his marine tank which is 9x3x3ft and stunning, he has a shoal of lyretail anthias which I commented on how gorgeous they are and how I would have loved them but would make for an expensive meal for Charlie. We went out to get the rock and he goes "oh come and see this" so off we go to the garage where he shows us a corner tank which he got especially made but then never set up. Needless to say within 5 minutes we have agreed to buy it and he will deliver it next month once we have the new flooring down. So my 3ft tank is getting closed and will become the sump for Barrys 5ft tank. I will take the sump that was with his 5ft and use that for the corner tank which I will be setting up as a reef and having anthias. SO there will be no freshwater tank after all. 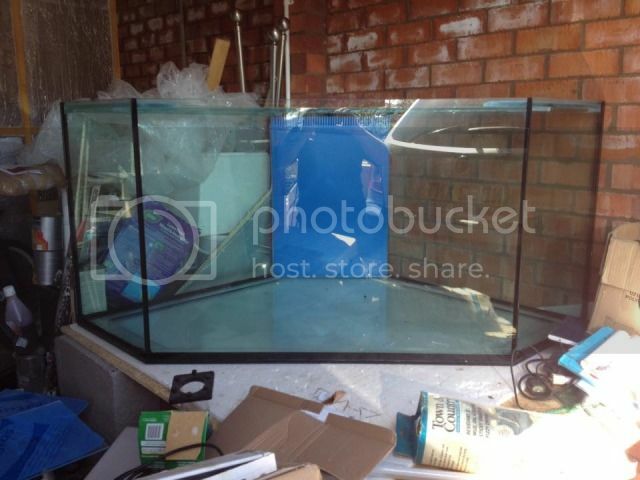 This is the new tank, its 500litres so a great size. That's going to look lovely. I don't expect it will be long before you get yourself a fresh water tank too!!! You aren't taking in the 3 ft. tank in and having 2 additional foot welded "MELTED" on to it? I attach peace's of glass together with lead. "It not water tight!" No lmao, the 3ft will be used as a sump tank for the 5ft. I have looked for and not found an explanation of the term and usage of a sumps. Is their one I have not found. I know sumps as a tank that collects water and pumps it out when the tank gets full. I realize this must be part of the filter system but don't understand it purpose. I appreciate your time explaining.